Bangkok (Thailand) – December 17, 2018 (travelindex.com) – Anantara Siam Bangkok is proud to present Carnival de Venice at Biscotti from 28 January – 11 February 2019. The festivities will unfold every evening with exquisite Italian food inspired by ingredients from Venice, the home of the Carnival. The carnival is an annual cultural event in Venice, mostly known for the traditional masks worn throughout. This historic event starts in February each year with visitors from all over the world. This year you can celebrate at Anantara Siam Bangkok hotel, bringing an Italian tradition to Thailand. Chef de Cuisine Andrea Buson at Biscotti will carefully prepare array of delectable dishes such as “Fritto Misto Alla Veneziana” – Venetian deep-fried mixed seafood, calamari, prawns, soft shell crab, fish fillet, vegetable sticks (THB 690++), “Spaghetti Alla Busera” – Traditional spaghetti with langoustine, tomato coulis, cherry tomato, parsley and chilli (THB 1,190++), and “Maialino Alle Mele” – Slow cooked Kurobuta pork belly, apple Sauce, Venetian style braised cabbage and sautéed turnip (THB 1,290++), naming but a few delicacies. (Prices are subject to 10% service charge and 7% government tax). 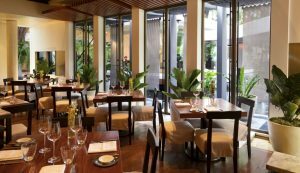 Each evening, dinner will take place at Biscotti, 1st floor, Anantara Siam Bangkok Hotel (BTS Ratchadamri), open daily from 6.00 pm. – 10.30 pm. Add a fine Italian wine from our extensive cellar to enhance your carnival experience.